Though this is the busiest season for most of us, it is also a time to sit back and relax. 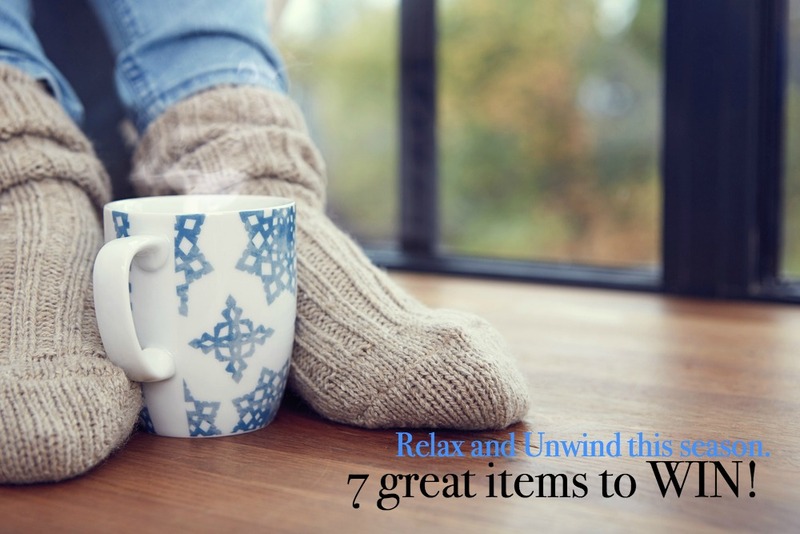 Today I have a bunch of items that will take you away from the hustle and bustle and let you enjoy a little quiet time. They all make great gifts too! This art book is fun and unique. Copy the pattern on the facing page by using the special scratch tool to reveal a contrasting background. Features 20 inspirational and decorative illustrations of flowers, leaves, and other botanical designs, which are some of my favorite things to draw. You can copy the example or feel free to make your own variations. The designs are created on perforated pages, ready to tear out and display! Have you seen these? Lots of small stickers put together to create a picture. It’s like a paint by number where they tell you which space to put what colored sticker. Keep going until your entire image is complete. In this case you’ll design 12 cute cats! This book is thick and nice. You’ll find 50 “lessons” curated from the best of Flow‘s two special drawing issues. Learn the strokes of items we see every day: a bouquet of flowers, a beloved teacup, colorful mittens, the kitchen table, a bike, jam jars, a cat, an apple tree. Along the way you learn about color, materials, perspective, tools, and negative space. Anyone who likes to doodle or sketch for fun will love this book! Does your family put together puzzles? We do mostly in the winter months which makes this puzzle perfect. Isn’t it lovely? Artwork on a puzzle! 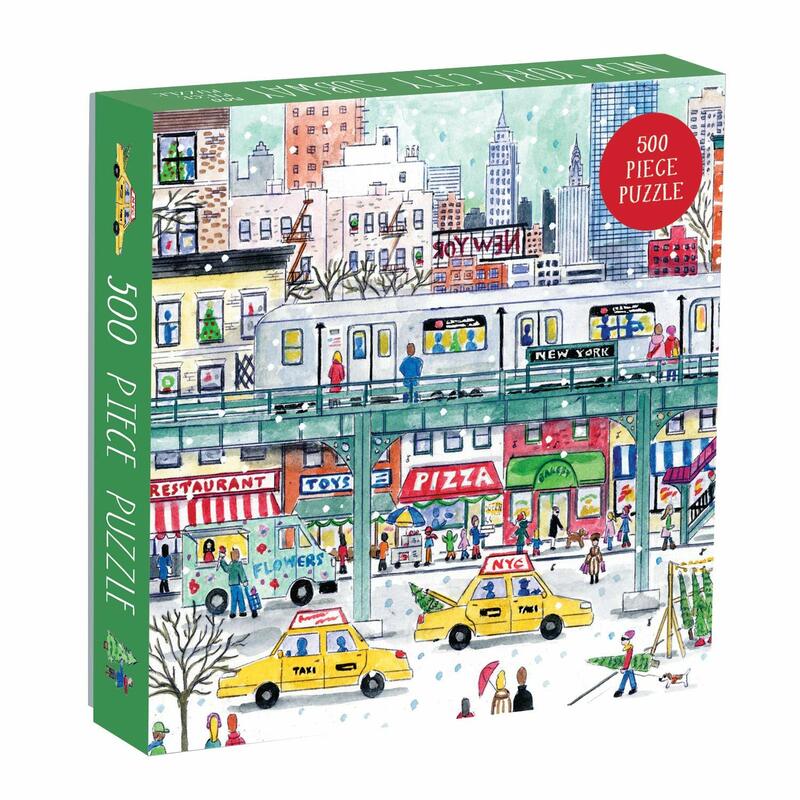 500 piece puzzle illustrating a New York City subway scene in winter wonderland. Learn more about the artist, Michael Storrings, and the idea behind the art photo puzzle inside the box too! He has many designs on Amazon! Introducing Akamai. A company that believes that personal care products can be healthy AND simplified. Grab a subscription and products will be sent automatically. I personally would love to open a gift like this! Non-toxic no-fuss items I use every single day. 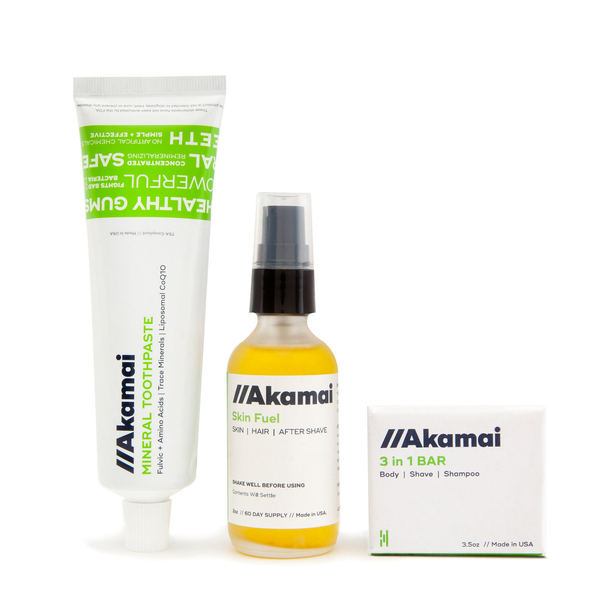 3 in 1 BAR – Wash, shave, shampoo, one bar does it all. Loaded with 8 botanical oils, and moisturizing glycerin, carefully balanced to benefit both skin and hair. Anyone can join. For free! A great site and resource to encourage a healthy night’s sleep. You will find articles to read, videos to watch and tapes (by Jeff Bridges!) to listen to. And you will find products to buy! The two products you can win today are not on the site quite yet they are so new. The Firewood Candles are hand-poured with all natural soy wax and cotton wicks. The firewood scent is a unique scent that captures the warm, smokey and aromatic pile of logs. You will also be able to relax with the Bath Teas. Both are great for gifts! You will also find their cute t-shirts, SLEEP STRIPzzz Sleep & Recovery Aid, – a dissolvable oral strip to help you sleep, and comfy gel foam memory toppers that will fit on top of any mattress! How will you Relax & Unwind this season? Don’t these all make great gifts?! 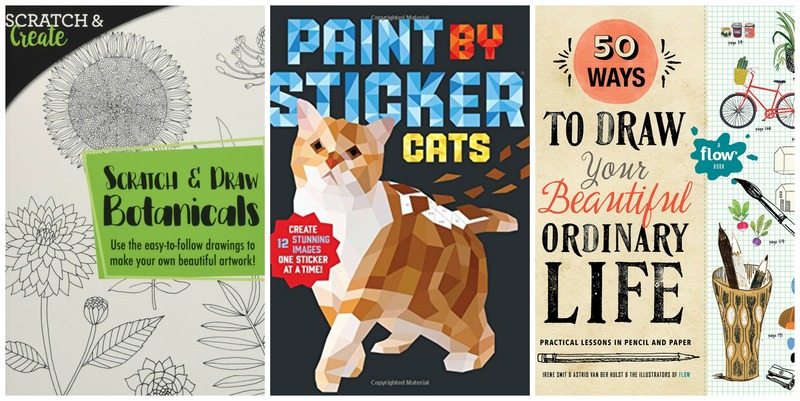 Scratch & Draw Botanicals, Paint by Stickers: Cats, 50 Ways to Draw, NYC Puzzle, Akamai Essentials Starter Set, Firewood Candle & Bath Teas from Sleep Club. I partnered with these brands who sent these products for free for this Relax & Unwind post. All opinions are my own and Amazon links are affiliate. This giveaway will end on Dec. 3, 2018 at midnight MST. Winners will be drawn via rafflecopter. Once a winner is drawn I will contact them and they will have 48 hours to reply before I draw a new winner. Giveaway is open to anyone in the US. You must be 18 years of age or older. Giveaway is not affiliated with Facebook & I release them of liability. Winner will be posted in the rafflecopter widget. Holiday Gift Guide Stocking Stuffer Giveaway ~ Kitchen! To relax I like to drink a cup of tea,hold my cat and watch one of my favorite t.v. shows. I really like just to sit back and drink a cup of good coffee and eat something sweet. I curl up on the couch with my blanket... then I am good. I love to read or play or watch netflix mostly. Trying to get back into blogging. Thanks for the fun giveaway! I like to read mysteries to relax and unwind any time of the year. I like to disconnect from my gadgets and curl up with my pup and a good book. I like to enter giveaways to unwind...or read. "What do you like to do to relax and unwind during this busy season?" I am all about the cocoa! I read to relax, unwind, and luxuriate in the magic of words! I like to cuddle up and watch some movies or read a good book. I relax by watching a movie or just taking a nap. I like to listen to music or watch a good movie. I usually lie down on the couch for a bit and look at a magazine. I like sharing a few cups of tea with my friends when we meet at Starbucks. I relax by taking a bubble bath with a hot cup of coffee and a good book! The holidays are always hectic and I like to relax with a cup of coffee. What.I would like to do is have a massage but cannot afford, so read a book, drink a cup a cocoa. A hot bath before bed helps me unwind. I would love a short weekend trip to relax and unwind. I like to kick back with a nice glass of tea and color! I like to put on warm slippers, grab a cup of hot chocolate and read a good book. I enjoy yoga, tea and magnesium. I like to read or watch Christmas movies. I love relaxing by my fireplace with a cup of coffee! I don't do much relaxing these days, but I do enjoy being entranced in music. There is some relief to be had with some gentle music and a fresh brew of tea. I like to workout and we also frequent the theme parks near by. To relax I curl up with a good book or put on some music. I like to relax with a good Holiday movie, a cozy blanket and a cup of hot chocolate. I read and drink tea to relax. I like to sit and read a good book with a good hot cup of coffee or a latte! Kind of silly, but some cold milk and a chocolate chip cookie to dip is something I like to do at night to relax. I like to get up before the little ones and read my stories with a cup of coffee on my side. I like to snuggle up on the coach and watch movies with my family! I like to relax and unwind by watching Hallmark Christmas movies while snuggling with my puppy. I garden to relax. Even if I'm physically working hard, simply being outside is nice. I like to take a nice long bath with a book. I like to do crafts,also watch tv with my family. It is relaxing for me when I'm entering sweeps! We are setting up our tree tomorrow. I love to sit by the tree lights and have a cup of tree to relax this time of year. I love to sit and relax with a book when I get stressed over the holidays. I love to get a coffee at a small cafe. Nice hot bath and pamper myself, a nice latte and a good book or movie. If I have the day to myself I draw and paint and blare the instrumental music. I like to hibernate to a degree. Read all the books I didn’t get to during the summer. Do some baking and spend time enjoying my home. I like to watch my favorite movies, go for a walk with my dogs or read. Sleep! Or sit back and relax with favorite movies. I relax with a glass of wine and watch Judge Judy on DVR. Takes my mind off everything and allows me to relax. Depending on the weather I go for a walk. Or...if cold or rainy hot chocolate and 30 minutes reading. I like to sip a cup of coffee and curl up with a good book or good movie. I read to relax. A good book and a cup of hot tea. I love to relax with a cup of coffee and a good book! What an adorable idea, paint by sticker. That sounds fun! I like to read by the Christmas tree, late after the kids have gone to bed. I am a reading fanatic I read everyday. To relax during this busy holiday season, I try to stay organized and so I do not feel rushed and pushed. I also try not to over obligate myself to others. When I fail at both, I just stop everything, take a ME break, have a cup of coffee, read a book and relax! I like to take time for myself amidst the hustle and bustle during the holidays, by reading a book and enjoying some seasonal flavor creamers in my coffee. Also baking cookies ahead and waiting for a day to relax and decorate them with my grandchildren, makes for a fun, yearly tradition. I like to grab a book and curl up in my bed or on the couch with a warm blanket. I also like to watch movies or catch up on shows I like. I always have trouble gearing down as I'm a terrible overthinker. I'd love to get back into art and the 50 Ways to Draw sounds so fun. It would be delightful to work on while the candles burned creating a much needed mini escape. I like to macrame, cross stitch or curl up with a book and hot tea. To relax I love to sit in my favorite chair, cover up with a blanket and watch old movies on tv. I read a good book to relax. When I can afford it, I like to get massages! I enjoy camping at the beach on the weekend to get away from the hectic holiday shopping rush. I prefer shopping when the stores first open and they are not as busy. I turn on the white noise machine by my bed and put an 8 hour Box Fan Ambient video on my FireTV Stick. We enjoy relaxing by the fireplace. A warm bath is always soothing, or, if I want to splurge, I'll get a professional massage. Life with 3 kids doesn't give me much time to relax, but I like to read and drink some tea or coffee. With a book and a cup of peppermint tea. I enjoy a cup of tea and a good book. Maybe the ever so often cookie to go with it... I also really love Elizabeth Mitchell's Christmas CD! Get a quick nap while my kids are napping! I like to read and sip warm coffee or tea! I like to light a holiday candle and have some Christmas music or an old classic Christmas movie on. I like to get a cup of coffee or hot tea and work on my planner or watch a good movie. I love to have some tea and watch some old movies. Oh I love to curl up in bed early and read a good romance book! I like to relax with a book & a cup of coffee and also playing with my dogs too. I relax by drinking tea and watching The Office. Snuggle with my kitty on the couch, with the lights out and the Christmas tree lit, while I surf the web on my iPad. I like to take a long walk in my neighborhood. It always relaxes me. I like to just sit down with a delicious cup of flavored tea and work on the internet....that or a nap! Thanks and God bless! I like watching Hallmark channel Christmas movies and drinking hot cocoa. I like to relax with a cup of hot cocoa and watch movies on the Hallmark channel. I usually relax at the end of the night by watching TV or reading a book with my kitten in my lap. I always enjoy the peace and quiet after a long day with the kids! I like to find a quiet corner, a hot cup of tea and a good book to get away from the holiday crazies. My favorite way to relax and get away from the busy season is a hot bubble bath with a good book to read while I soak up the calming scent I have chosen at the time for the bath and the peace. I like to read or sit and relax in front of the tv. I love to read a book and enjoy a cup of white tea! I like doing puzzles, making crafts, relaxing with the family & entering giveaways. Thanks for the chance to win! I like to have a cup of coffee. I like to relax with a long hot bubble bath. I exercise to relax and unwind during the busy season. I love to just curl up on the couch with a good book! I read to relax. And for a real treat, do a foot soak with lavender or eucalyptus epsom salts. I don't have the bubbles too high, because they splash out. Fortunately, I have a lot of things that relax me. I love to write, to read, to color, to do puzzles. I like to read and try to take a nap! I like to watch hallmark movies!